Whether you are scheduled for an initial consultation, an in-office test or a hospital based procedure you will be contacted by a member of our staff with pre-appointment instructions. Should you have any questions, please do not hesitate to contact us at 201-996-9244. Cardiac catheterization is an in-hospital procedure used to diagnose and treat certain heart conditions. During a cardiac catheterization an interventional cardiologist threads a thin tube called a catheter from the radial artery in the wrist up to the heart. Once at the heart, a contrast dye is injected which allows the interventional cardiologist to see any blockages in the arteries. Cardiac angioplasty is the diagnostic portion of a cardiac catheterization. During a cardiac catheterization an interventional cardiologist threads a thin tube called a catheter from the radial artery in the wrist up to the heart. Once at the heart, a contrast dye is injected which allows the interventional cardiologist to see any blockages in the arteries. If blockages are found, the interventional cardiologist will inflate a “balloon” to open up the clogged artery. In some cases, the interventional cardiologist may also insert a stent to ensure the artery remains open. An implantable cardioverter-defibrillator (ICD) is a small battery powered device that is implanted underneath the skin in the chest and has electrodes which attach to the heart through veins. An implantable cardioverter defibrillator may be recommended for patients with extremely fast or chaotic heartbeats (arrhythmias) which can cause the heart to stop beating. The implantable cardioverter-defibrillator can recognize these arrhythmias and deliver electrical impulses or shocks to restore a regular heartbeat. ICD implantation is done in the hospital using local anesthesia. An echocardiogram utilizes ultrasound to allow for advanced imaging of the heart. This test allows the cardiologist to see all the chambers of the heart including the major blood vessels. More commonly know as an EKG or ECG, an electrocardiogram records electrical signals as they flow through the heart. The cardiologist may use an electrocardiogram to diagnose irregular heartbeats and rhythms. Electrophysiology Mapping is performed in the hospital. Electricity flows through a healthy heart in a regular, steady pattern. When a problem occurs with the electrical flow of the heart, an arrhythmia occurs. During Electrophysiology Mapping a specially trained cardiologist studies the heart’s electrical system to diagnose arrhythmias and electrical abnormalities. The cardiologist may request that a patient wear an event monitor to diagnose certain cardiac symptoms such as palpitations, chest pain, dizziness, and shortness of breath. Internal Loop Recorders are a small recorder device about the size of a stick of gum that is placed under the skin to record cardiac electrical activity. This device is used to diagnosis arrhythmias that may pre-dispose patients to fainting and stroke. The physician can monitor cardiac activity through trans-telephonic transmission. The device recorder has a battery span of one year and can be removed at any time. A stress test is utilized to determine how well your heart functions during physical activity. Since exercise causes your heart to pump harder and faster than it does during most daily activities, a stress test can reveal problems that may only be noticeable while the heart is “stressed” due to this exertion. A stress test usually involves walking on a treadmill or riding a stationary bicycle while your heart rhythm, blood pressure and breathing are monitored. For patients that are unable to walk on a treadmill, a nuclear stress test may be performed stationary with a specific medication. A nuclear stress test allows the cardiologist to see blood flow images of the heart both before and after exercise. When there is a problem with the heart not beating fast enough or the normal electrical signal which causes your heart to beat is not working efficiently, your cardiologist may recommend a permanent pacemaker to regulate the heart’s function. Pacemaker implantation is performed in the hospital setting while the patient is under local anesthetic. Cardiac catheterization is an in-hospital procedure used to diagnose and treat certain heart conditions. During a cardiac catheterization an interventional cardiologist threads a thin tube called a catheter from the radial artery in the wrist up to the heart. Once at the heart, a contrast dye is injected which allows the interventional cardiologist to see any blockages in the arteries. If blockages are found, the interventional cardiologist will inflate a “balloon” to open up the clogged artery. 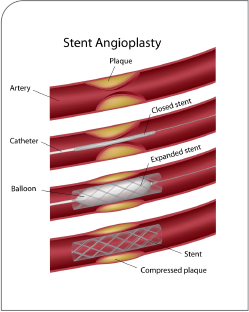 In most cases, the interventional cardiologist may also insert a stent to ensure the artery remains open. A vascular ultrasound provides images of the body’s veins and arteries. In some cases a Doppler ultrasound may be part of the vascular ultrasound. A Doppler ultrasound evaluates the blood velocity as it flows through the blood vessels of the body. This website is for informational purposes only and does not offer any medical advice.